In this WASPcam action-sports camera tutorial, we show users how to pair their WASPcam GIDEON camera and Wireless Wrist Remote with Live Viewing Dsiplay. The new GIDEON's Wrist Remote allows users to control photo/video recording of their camera from up to 25 feet away, offers a live viewing screen and it includes same functions as normal wrist watch (ie date, time, alarm, lap timer, etc). VERY first thing I noticed when turning on my Gideon was the very clean and bright LCD top display. Everything was crisp and easy to read. There is no mistaking which mode you are on and the system is just very easy to use as well as simple to change setting. With a few pushes of the button you can easily change the timing on the time lapse and edit the time on the camera. Once I finally got video rolling and was able to look at it I was very impressed. This camera is $80.00 cheaper then the GoPro Black 3+ and the battery life is a little better as well as the cameras ability to store more video/photos on a microSD chip. Meaning on a 32GB chip on the GoPro it will only store about 4 hours of video, now on the WASPcam Gideon I am able to load about 7 hours on the SAME chip with the SAME 720p 120fps setting. A HUGE plus for the Gideon. The photos on the gideon are excellent as well. On time lapse at 16MP the photo resolution is 4608 x 3456. While the GoPro is only 3840 x 2880. Again PLUS for WASPcam Gideon. Quite frankly that is all I needed to buy this camera. It shoots 720p at 120fps, has better photo resolution, better battery life AND stores more video/photos per gig then GoPro. Almost forgot it’s $80.00 CHEAPER and if you are worried about having to buy all new accessories you can but an adapter for the Gideon and use GoPro mounts. 10. 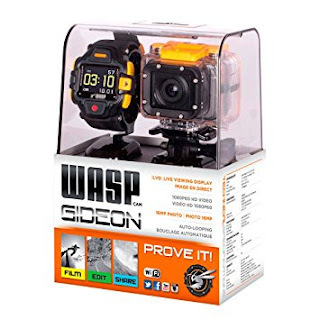 WASPcam records HD video and images (5 MP, up to 1080p30). 9. It comes in a waterproof casing (and a vented housing, along with many other mounts and accessories, that can be purchased separately as well). 7. You can connect your HDMI (watch on your TV), USB cable (included with camera), microphone, and your memory is stored onto a Micro SD card. 6. Compatible with WASPcam and GoPro mounting systems (see adapter here). With WASPcam’s free smartphone app, ActionCam!, users can instantly turn their phone into a live viewing screen and remote control. Very convenient you want to ensure just the right angle of your WASPcam. 4. WiFi compatibility: sync your camera with a WASPcam Wireless Wrist Remote or smartphone, to watch and record your footage. 3. Using WiFi, connect a WASPcam to its exclusive ActionCam! smartphone app. Instantly turn your phone into a live viewing and recording screen. iPhone owners may download app from Iphone App Store, and Android folk can download it from Google Play. Even while recording, viewing continues on your phone’s screen, ensuring just the right angle. 2. Comes with a slick metallic camera lens cover to protect your WASPcam and prolong clarity of your footage. 1. Film, edit and share INSTANTLY with your friends and fans, over your favourite social pages. That’s what it’s all about: proving to your friends how far you’ll go for the best shot!